Irfan Naseer, Irfan Khalid and Ashik Ali. 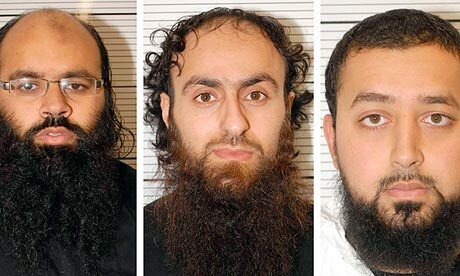 On 21 February 2013, a London jury convicted three young British men of being ringleaders of an al-Qaida-inspired plot. The idea was to explode knapsack bombs in crowded parts of Birmingham, England's second-largest city. The men had pleaded not guilty, but were recorded discussing plans for attacks that one said would be "another 9/11." Irfan Khalid did not give evidence in court. Ashik Ali is severely visually impaired and had to read court documents on a large screen. When detectives raided his home they found he was in possession of a stack of videos containing speeches by Anwar al-Awlaki. Anwar Al-Awlaki (above) was born in the USA, was once a chaplain at George Washington University, and most likely is an agent of the CIA. Working for the security services? "The easiest way to run a false flag attack is under the cover of a military exercise," says Captain Eric H May, a former US intelligence officer. The 7 July 2005 London Tube Bombings occurred the same day as a government terror exercise. "The chances of a terrorist attack occurs within hours of the completion of anti-terrorist exercises, as in Madrid, or the same day that they are developing, as happened in London, or New York on 9 11, is one in millions." It is believed by some people that the CIA and its friends may have used a private military group to carry out the Mumbai attacks. Some people believe that the CIA, Mossad and their friends would not hesitate to attack the UK. Axis Security, opens new office in Birmingham. This is the video of Part One of the ongoing Sibel Edmonds Gladio B interview series. For the audio of this interview, CLICK HERE. Abdullah Çatlı – Note: Wikipedia page omits key details of prison escape, etc. EDL vs UAF the manufactured false dialectic opponents stirred up by the likes of propagandist Raheem Kassam. I suggest you take a good look at Raheem Kassam who is supposedly of Muslim decent although his twitter account has pictures of him in Washington DC drinking beer and he boasts on twitter of his drinking exploits. Kassam works for the Henry Jackson Society a far right some say fascist organisation but promotes and backs to the hilt the so called left wing UAF and converses with Rupert Murdoch curiouser and curiouser. It is my observation that Kassam and his affiliates are the root source of much anti-Iranian /Islam propaganda and that his role is to agitate and stir up hatred on all sides both in the UK and internationally. Kassam and his spawned "Student Rights" organisation in conjunction with "The Commentator." was instrumental in the faked propaganda campaign and lobbying on behalf of the Israel lobby which led to the political demise of Baroness Tongue for "anti-Semitism". Here he boasts of his sociapathic exploits. Raheem Kassam is the director of the organisation and has been since October 2009. Raheem is from a Muslim family and grew up in West London. He attended the University of Westminster, where he studied politics and went on to work for Lehman Brothers, a public sector consultancy and then to run Student Rights. Raheem has also worked for many campaign groups including most recently the Bow Group. Raheem is also the Executive Editor of the online magazine The Commentator. I also suggest you take a look at the Advisory board of "Student Rights"
An example of Kassams recent efforts to stir the Nuclear pot. There is no doubt that North Korea’s test will terrify the people of South Korea as well as other nations in the region. The West will not only be concerned by the threats and strains created by an emboldened North Korea, but also by the reaction of its partners. Over the past few years, North Korea and Iran have stepped up their co-operation and interdependence over their respective nuclear programmes. This was made all the more clear by Iran’s congratulatory remarks to North Korea yesterday. Their alliance threatens the West and its allies – not just militarily or territorially, but economically also. The British defence secretary Philip Hammond noted last week that an attack on Iran could drive oil prices up and threaten our economic recovery. As the situation stands, Iran holds many cards in the region already. Both of these tyrannies must be confronted. The efforts and hypocrisy of Kassam appears to fit the subversive radical model espoused by Communist agitator Saul Alinsky and the Student Rights organisation are a clear example of how our educational establishments are being subverted and students mislead and radicalised. "Student Rights is a non-partisan group dedicated to supporting equality, democracy and freedom from extremism on university campuses. We were set up in June 2009 as a reaction to increasing political extremism and marginalisation of vulnerable students on campus. Led by director Raheem Kassam, the organisation consists of staff, interns, student activists "
Additionally much of the UK mainstream press have fallen for his manipulative nonsense and quoted or mentioned Student Rights whilst covering the Le-Pen story. Note I take the view that the Le-Pen visit is probably as contrived to cause trouble as the utterances of Kassam and his ilk all part of the false left wing right wing stageshow. The Birmingham event was publicised and known about. Certainly amongst the businesses in the area affected (Broad Street). Maps and times were distributed by Birmingham City Council. I was working that day and as a pedestrian was able to walk down the pavement, though the road was closed to traffic, something else that was publicised. It was strange seeing so many police vans and ambulances etc in one place. I was also extremely wary, as thanks to aangirfan, I know the uncanny coincidences in the past when an "exercise" is occuring.